World Community Grid Needs Your Vote to Win a Webby Award! We’re excited to announce that World Community Grid has been nominated for a Webby People’s Voice Award, often called “the Oscars of the internet.” Being nominated is an honor, but we need your vote to win. World Community Grid has been selected as one of five nominees for the prestigious Webby Awards in the Corporate Social Responsibility category, which honors corporations with a commitment to help make our world a better place. You can help us win this coveted award by voting today. Celebrating its 20th year, The Webby Awards is often called “the Oscars of the internet.” This competitive award received nearly 13,000 entries from 65 countries around the world. The winner of the Webby People’s Voice Award is determined solely by a public vote, which typically garners millions of votes each year. 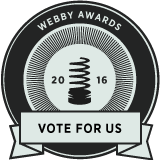 Voting for the Webby’s People’s Voice Award ends on April 21, so pleasevote today and help us spread the word. Thanks to everyone for your support! Please note: In order to participate, you will need to sign up on The Webby Awards site using an email address or a social media account, which will be used to confirm your vote.